Manual massage of the upper body is also offered, with three kinds of massage places available –overall, partial and fixed point. Five selectable speeds are offered for each massage mode. The mechanical hands may be adjusted upwards/downwards when the massage is performed under fixed mode. The width of massage balls may be set to wide, medium or narrow under the massage modes of tapping, shiatsu and knocking. Airbag massage: the seat cushion is equipped with 3 airbags and the calves are equipped with 8 airbags. Two massage strengths are available. Vibrating massage: the seat cushion may produce one group of vibrations with 2 vibrating-massage balls. Lying angle automatic setting:after inserting coins, the back rest and legs will be positioned automatically at a comfortable angle. 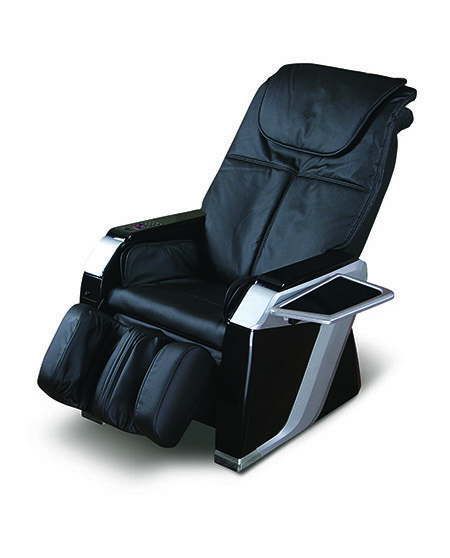 The massage chair will revert to the original position after the set time.